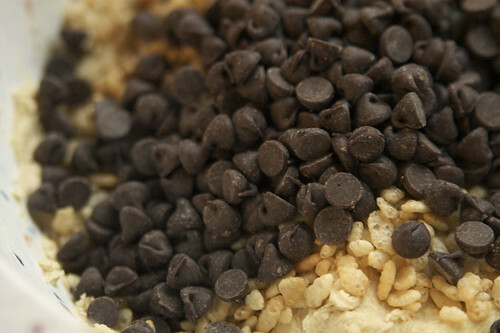 Fact*: Everyone has a grandmother who knows the best chocolate chip cookie recipe known to man. That's just how it is. But make no mistake, my gram could bake the best chocolate chip cookies around. *This is in no way an actual fact; I have done no research of any sort to back up my claim. Until I went searching through her recipe box, I had no idea how many variations of the chocolate chip cookie that she had collected. In fact, I couldn't find the exact recipe we used every time that we baked cookies, although I did eventually find a card that was nearly perfect. 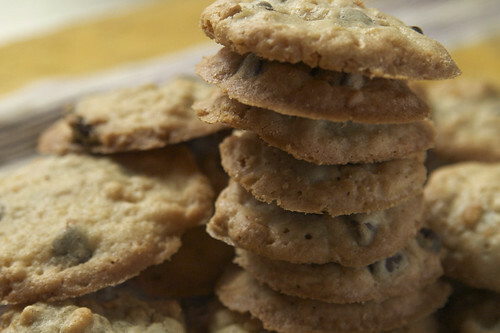 She made her chocolate chip cookies so often that she didn't need to refer to a recipe card for them. 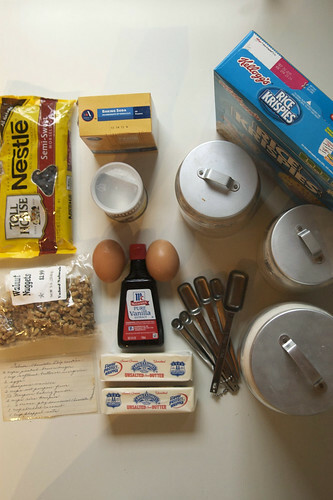 Any references to recipes while making the cookies were solely for my benefit, so she would just point me to the ingredient list on the back of the chocolate chip bag while we gathered up the ingredients, but then say "But we're really going to use a little more of this, and add in yy and zz. Those are what make the cookies so good." A typical kid, I decided that what went in to my grams cookies was highly classified information, and would make a point of telling people that I knew what the secret ingredients were. For awhile it seemed like we made these cookies every time I went to her house, something that I'm sure my nutritionally concious mom loved. Then, I started visiting less often, and for shorter times. We stopped making cookies, since you can't very well make a batch of 7 dozen cookies in a 45 minute visit. I think at that point she had stopped baking for the most part, anyway, except during fits of insomnia. Then, one morning, I woke up to flurry of ringing phones and my parents racing about. Due to some construction on the house, I had been sleeping on a couch downstairs. At some point, my dad poked his head into the room and announced "gram is dead," before he disapeared again, gone to who remembers where. 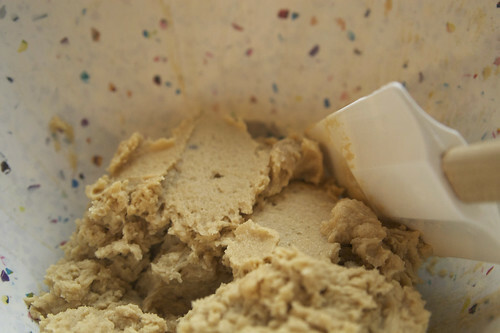 The next thing I remember is standing in the kitchen creaming together enough butter and sugar to make a gigantic batch of chocolate chip cookies. I must have gone to the grocery store and gathered up baking supplies, because there's no way that we had adequet cookie supplies in the house. I don't know what made me decide that baking chocolate chip cookies was the right thing to do at the time; it just seemed like there wasn't anything else that made sense. I'm not sure if all of the cookies ended up being eaten or not, because I certainly wasn't in the cookie eating mood, but I know my dad distributed some of them to people. At least they were there if anyone wanted one, and things can't be entirely hopeless if there are family recipe cookies around. This was the first time I've made chocolate chip cookies with this recipe since then, and I don't think I'll go back. I had forgotten how good they are. 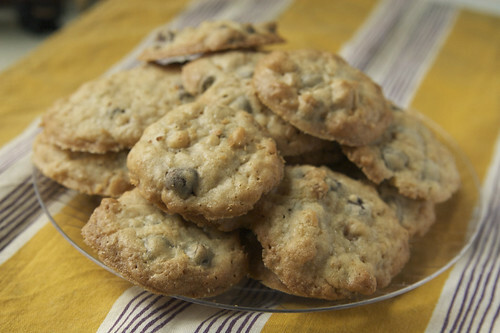 A word of warning, if you like fat, cakey cookies, this won't become your favorite chocolate chip recipe; these cookies have golden brown edges and a chewy crunch to them. The recipe card also calls for 1 cup of shredded coconut, but trust me on this, we never added coconut. Cream the sugar and butter in a large bowl. I used 1/2 cup of white sugar and 1 1/2 cups packed brown sugar. Add the eggs and vanilla. Beat well. In another bowl, combine the flour and baking powder. Mix in to the batter; it's easiest if you add in the flour in 2 or 3 portions, mixing well between each. Stir remaining ingredients in to the batter. 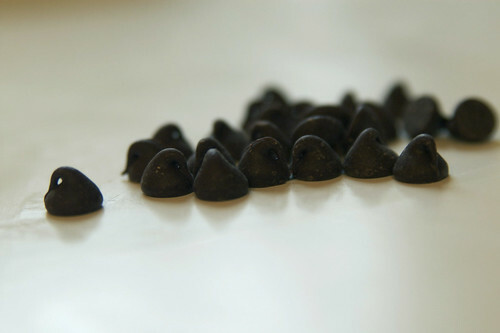 Drop by heaping teaspoons on to a greased baking sheet. Bake for 10 to 12 minutes or until lightly brown. 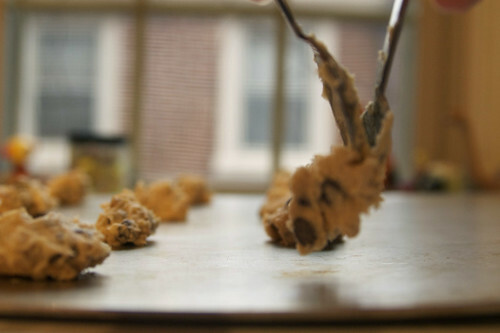 Remove the cookies from sheet and cool on a rack. 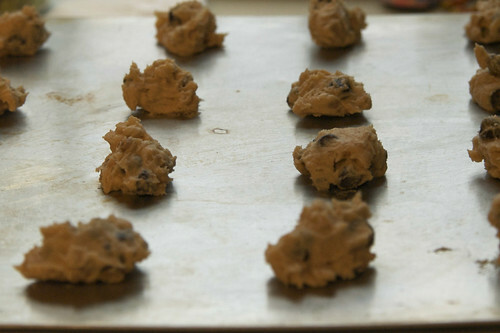 The recipe should yield about 7 dozen cookies. Eat all the cookies. Okay, fine, you can share them, but only with people who are very nice. Rice Krispies and walnuts, huh? I will definitely have to add these to my holiday cookie pile. OH yes. I said holiday cookie pile. A pile, you said? OH SNAP! These sound delicious - and the story of your grandma's death is heart-warming, albeit terrifying to me because my grandma is still with us and she better remain here for another 10+ years!